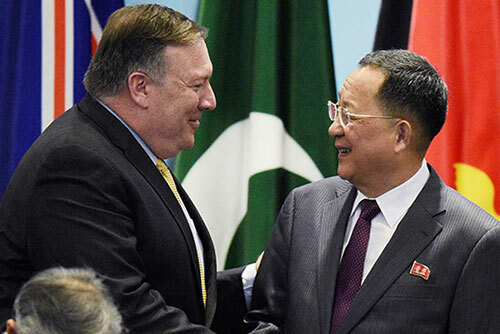 U.S. Secretary of State Mike Pompeo says that North Korean Foreign Minister Ri Yong-ho reaffirmed his country's commitment to its denuclearization during the recent regional forum in Singapore. Pompeo made the remarks on Sunday to reporters on a flight to the U.S. following his Southeast Asia tour, which included a trip to Singapore for the ASEAN Regional Forum. At the forum, the North Korean top diplomat complained about Washington's calls to maintain sanctions against the regime and reluctance to declare an end to the Korean War. Ri also repeated calls for phased and simultaneous steps to implement the agreement reached at the U.S.-North Korea summit on the complete denuclearization of the Korean Peninsula in exchange for U.S. security guarantees. Asked if he was concerned about those remarks, Pompeo said that the tone of the North Korean statement was far different than it was last year. Pompeo said that the foreign minister made very clear of the North's continued commitment to denuclearize. He added that the minister's comments were different from the anger and hatred typically found in North Korean statements over the years.